All you need to know about Infosys Referral Drive 2018 can be found out on this page. Students who have passed out in year 2016, 2017 and 2018 are eligible for this drive. This referral drive is for for Freshers even the news launch the heading was Infosys Referral Drive for 2018 Batch freshers, though in description it was mentioned that 2016 and 2017 people are also eligible, you can find Infosys Referral Drive eligibility criteria on this page as well. The above package is for General Infosys recruits but Infosys offers higher packages for students from Tier 1 and Tier 2 Colleges you can find more about Salary Structure here. If you have any question please comment below in the comments section at the end of the page. We will reply there :). Find latest syllabus here on this page. Infosys is conducting the off campus drive for students who have passed out in 2016, 2017, 2018. Find out how to apply for this on the how to apply section below. There are 5 phases of the drive i.e test will be conducted 5 times currently 3rd phase is going on and 2 phases are left. Infosys has introduced Infosys referral drive for 2016 and 2017 graduates, the company has asked employees to refer Freshers and Experienced both. He will refer you and you will get email from Infosys regarding the drive. Your friends at Infosys can refer you before deadline ends(Check Deadline date with Infosys Employees for the Infosys off-campus referral drive 2018. Engineering students who passed out in the year 2018 and 2017 are eligible to apply. In case you have done both, 12th and equivalent diploma, you should have secured minimum 60% aggregate marks in both courses in Infosys Off Campus Drive for 2018 Batch. No pending backlogs at the time of appearing for the Infosys. It is mandatory to declare pending backlogs, if any, while applying for Infosys through campus connect. What are the Official Proofs and Documents you must bring for Infosys Off Campus Test Center? Infosys has changed their Questions Bank and Hiring Pattern from September 2017 and they instead of AMCAT now use DevSquare to hire. You can study for Infosys from our Website’s Infosys Dashboard. Click here to Visit our Infosys Dashboard all questions are DevSquare based and we will also suggest you to bookmark this page for Preparation Purposes. What is the pattern and sections in the Written Round? Ans. You can find all the details on our Infosys Preparation Dashboard. You can find the latest Syllabus for Infosys on our Infosys Syllabus page on our Infosys Preparation Dashboard. I attended Infosys On Campus Placements, I am still eligible for this drive? If you haven’t appeared for any Infosys drive in the last 3 months may it be on Campus or Off Campus, you can apply for this drive ideally. But, we have seen Infosys not checking it, they have written this in the referral drive mail though. But, they don’t check this, so in any case do apply for this drive. Will I have to go to a test center to give the test or I can give at home? Before 2017 Infosys used to not ask Coding or C/OOPS questions from candidates on Non CS-IT branches. But, now since they don’t discriminate. They will ask Coding and C/OOPS Technical Questions from Non CS-IT branches also. You’re applying for a IT services company, they will obviously expect you to know coding. While I was studying in college, my roommate and I often use to discuss about being placed at Infosys. 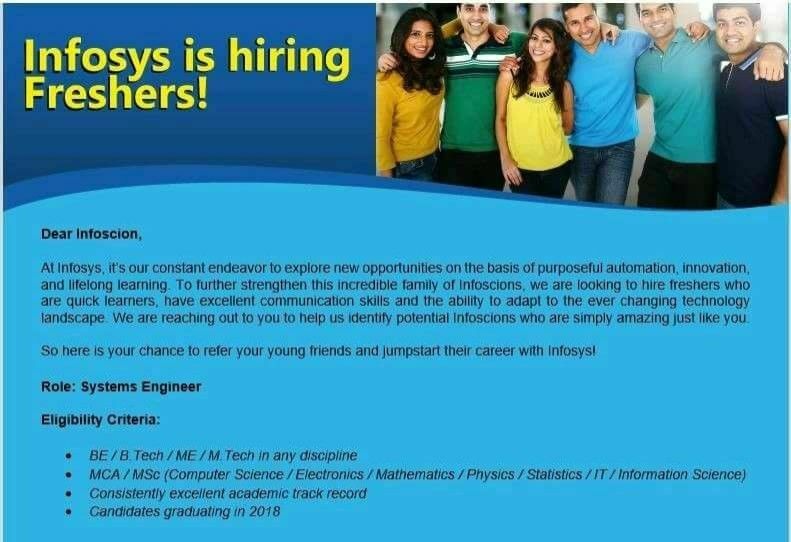 With the boom in the industry at that time, Infosys opted for off-campus recruitment. 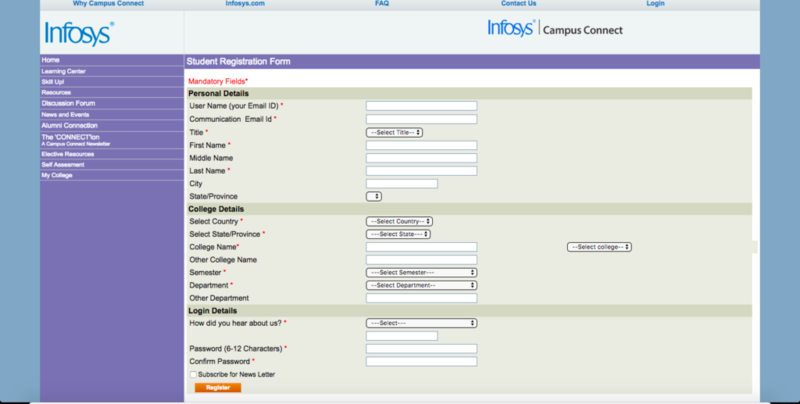 They accepted interview applications via http://campusconnect.infosys.com/registration/studentregistration.aspx. 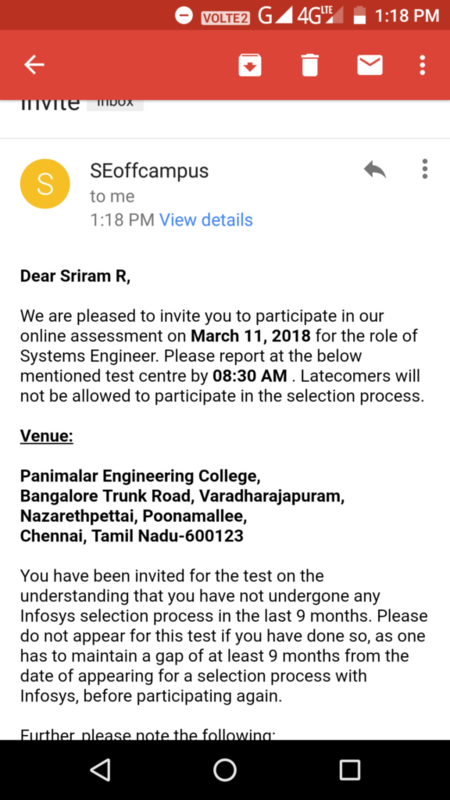 I filled up all the details on this portal, and I got an email for Online Exam going to be conducted in Jeppiaar Engineering College, Chennai. From school days, I was not good at Maths and was a bit nervous to appear for Quantitative Aptitude and Logical Reasoning. 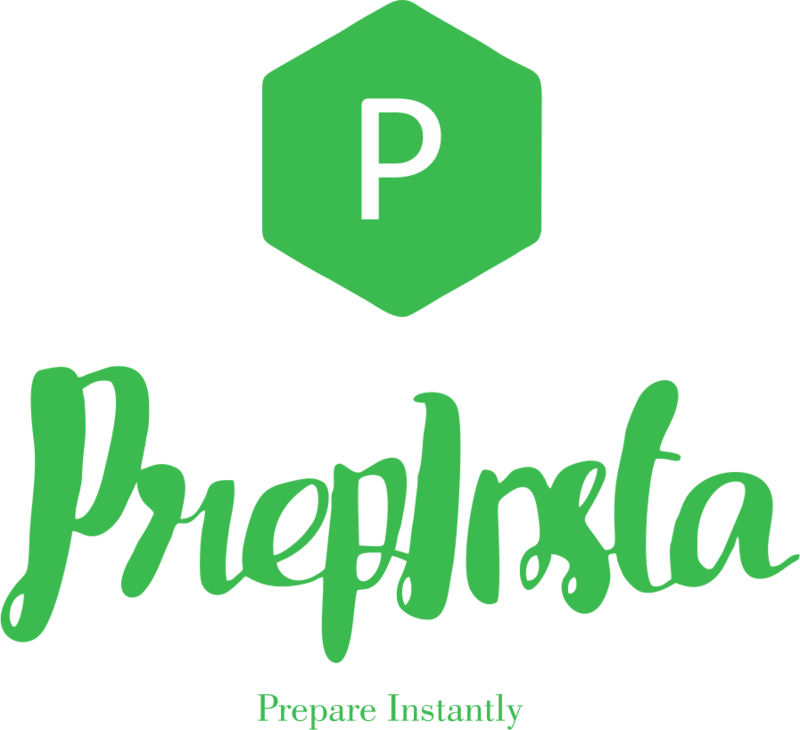 The only thing which saved me was that the prior practice of questions with PrepInsta. I got a major idea of questions to be asked, and I got a firm belief that I will clear the exam. My only strong zone was English and vocabulary. I relied on verbal section a lot. After quickly completing the questions of previous two sections, I was waiting to appear on the subject of my interest. After a series of thorough verification I managed to answer 35 questions with 99% confidence, but for the remaining five questions, I had fewer clues. Overall, I was confident enough to crack the first level of the interview. It was a great moment, and my heart started pounding knowing that I have been shortlisted for next round of interview that will be happening the next day. · What is your project all about? · Why should Infosys hire you? How will you contribute to the growth of the company? 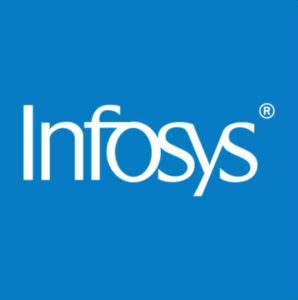 · What do you know about Infosys? · Are you comfortable with working in shifts? · Which subject you like and why? While losing confidence in one or two questions, I responded well to the rest of the questions. I believe the round was to check my communication skills. I was expecting a positive result after answering all the questions. That was an extended week than a usual one when I had to wait for the final results. Finally, on a Sunday evening, I received the mail from them saying that I was selected as the system engineer trainee role.